Here’s a fun way to approach photographing in busy tourist attractions. Be creative! Easier said than done I can hear you saying. Really, when confronted with people everywhere, start looking from different angles, get low, get high or just tilt your camera. Three weeks ago, I showed you how I used tourists watching a show in front of Cinderella Castle at the Magic Kingdom in Walt Disney World to create a good travel photograph. The photo today was taken a little before that one. I tilted my camera to eliminate most of the people and included the Partners Statue with the castle as a backdrop. 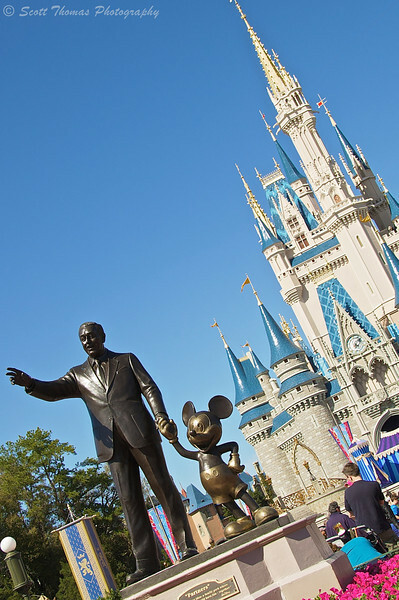 A creative view of the Partners Statue in front of Cinderella Castle at the Magic Kingdom, Walt Disney World, Orlando, Florida. Nikon D70/18-200VR, 1/400s, f/10, ISO 200, EV +0.3, 28mm focal length. Another way to get your creative juices going is to try photographing a subject from above, below and at the subject’s level. 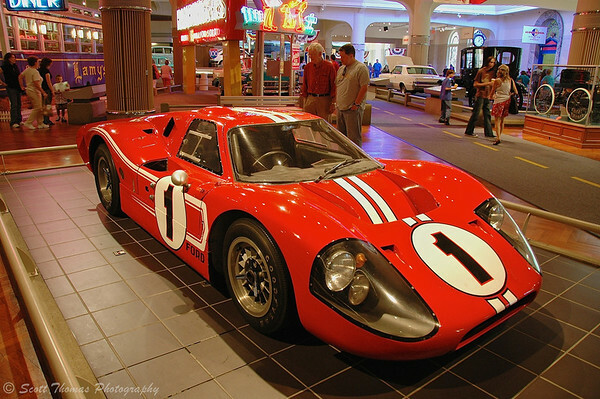 When visiting the Henry Ford Museum in Dearborn, Michigan a few years ago, I got this photo of the Ford GT-40 race car which raced at Le Mans back in the late 1960’s. Red Ford GT-40 race car in the Henry Ford Museum, Dearborn, Michigan. Nikon D70/18-200VR, 1/15s, f/3.5, ISO 400, EV +0.6, 18mm focal length. I like this photo as it shows other people enjoying the museum. I still wanted a more personal view of this car. I got down low in front of it and went “eye to eye” with this powerful car. 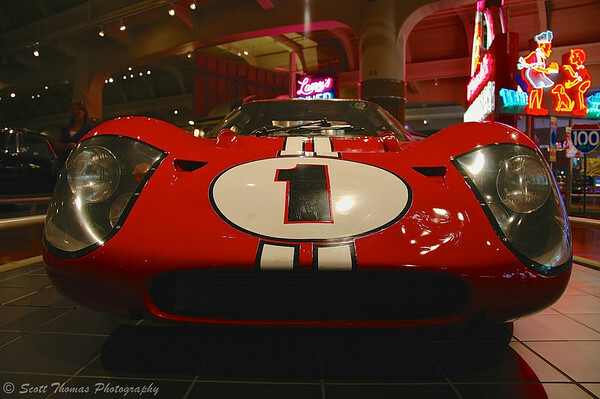 Eye to eye with a Ford GT-40 race car in the Henry Ford Museum, Dearborn, Michigan. Nikon D70/18-200VR, 1/20s, f/3.5, ISO 200, EV +1.3, 18mm focal length. Disney park fans have a saying, “Look up, look down”. I have an addition for all photographers, get LOW, get HIGH and look ALL around. Let your creativity go and enjoy the magic! This entry was posted in Photography and tagged 18-200mm vr, blue, car, cinderella castle, creative, dearborn, florida, gt-40, henry ford, magic kingdom, michigan, museum, nikon D70, orlando, partners, race, red, sky, statue, tilt, walt disney world. Bookmark the permalink. Getting on their eye level works great with animals too. And kids. Thanks for your comment, Barry.